The National Institute for Occupational Safety and Health (NIOSH), part of the Centers for Disease Control and Prevention, recently awarded George Delclos, M.D., Ph.D. and David Gimeno, Ph.D. with a $1.3 million grant for their project on asthma in Texas healthcare workers. Delclos and Gimeno are faculty members of the Southwest Center for Occupational and Environmental Health in the Division of Epidemiology, Human Genetics and Environmental Sciences at The University of Texas School of Public Health. 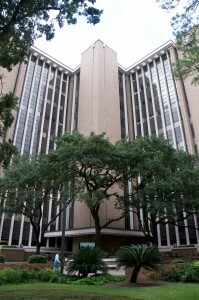 The School of Public Health is part of The University of Texas Health Science Center at Houston (UTHealth). In the U.S., asthma prevalence has grown by almost 15 percent and it is estimated that 15-to-25 percent of adult cases are caused or aggravated by work-related factors. Certain occupational groups are at an increased risk of developing work-related asthma, particularly healthcare workers (HCWs). In 2003, the same authors found that contribution of occupational exposure to asthma in HCWs is not trivial, especially among nurses, and that risk of asthma after entry into a healthcare profession was significantly increased for tasks involving medical instrument cleaning and disinfection, general cleaning, use of powdered latex gloves, and the administration of aerosolized medications. Over the past decade, healthcare-related practices have changed, as has the use of certain products. It likely that these and other changes in healthcare setting practices, coupled with increased awareness of asthma in HCWs, have had an effect on the burden of asthma in this worker population. The goals of this project are to estimate changes in the associations between occupational exposures and asthma among HCWs during the last decade as well as to assess the socioeconomic impact of asthma in HCWs and, where possible, compare them to the situation at the time of the 2003 survey.